Read the article in Global Citizen. Ouen Chomroeun and her team raise awareness of the importance of hygiene in villages. PURSAT, Cambodia — Ouen Chomroeun, 54, has been building and selling toilets since she was 17. 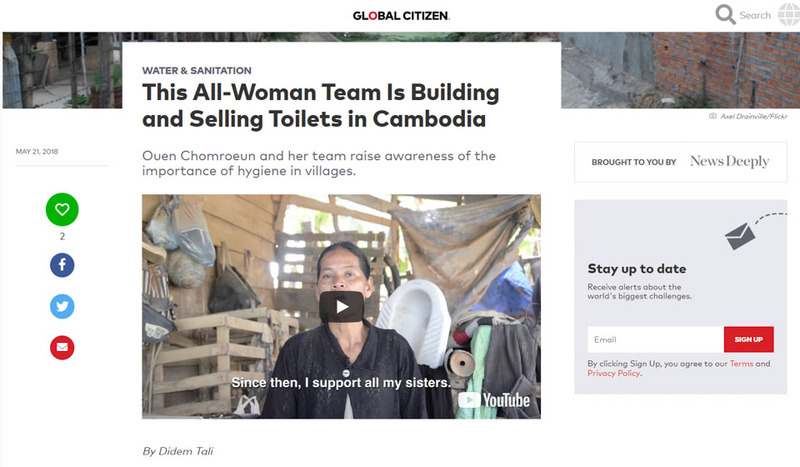 In 2011, she teamed up with the charity WaterSHED, and since then she has marketed and sold hundreds of toilets in Cambodian villages with the help of her two female employees. Although toilet supply chains are often male-dominated, currently around 200 women in Cambodia operate as small-scale toilet entrepreneurs, according to WaterSHED’s figures. They not only sell, market, and install toilets, but also talk to their communities about the importance of sanitation and hygiene, changing and saving lives as they gain financial independence. This article originally appeared on Women’s Advancement Deeply. You can find the original here. Read more of Chomroeun’s story here.